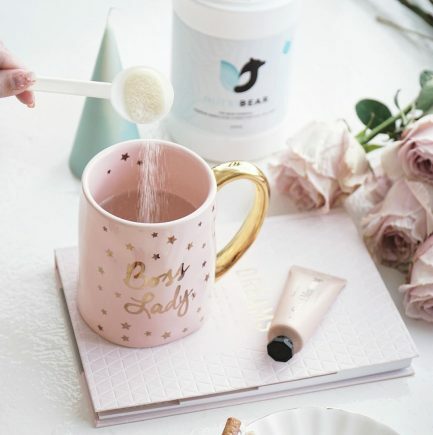 The Bear Essential Hydrolyzed Collagen is the perfect addition to your busy routine for healthier joints, brighter skin, stronger nails & shinier hair. Mix 1 scoop of this odorless, pure fish collagen powder to your favorite beverage daily to ward off signs of aging. All our products are made in Malaysia and adhere to the standards of HACCP, GMP, and Halal. Extracted from the scales of freshwater fish, The Bear Essential is a pure hydrolyzed fish collagen supplement with a molecular weight of 3,000 daltons (making for easier absorption). It contains glycine, proline, hydroxyproline, alanine, and arginine in higher-than-average doses so you can notice a visible difference in your health. Mix 1 scoop into any drink, any time of the day. ● When taken in conjunction with Vitamin C, hydrolyzed collagen can support the production of protein within the body – especially your skin, cartilage & organs. ● When taken in conjunction with Vitamin D, Calcium, Magnesium and Zinc, it will aid in the maintenance and repair of your bones over time. It is actually quite hard to give a general protein recommendation. Daily protein recommended will depend on the body-weight. In order to calculate the recommended protein considering collagen multiply 0.8 by the weight in kg and then subtract 10g which equals the daily consumption of protein 0.8g/day/KG body weight. Disclaimer: Results may vary from person to person. Some may see results within a month of consuming collagen, others might need more time. My skin has started to look more radiant ever since I consumed this collagen. In fact, I’m looking more radiant from within! Thank you! I battled with acne during my teenage years. Anyone who has suffered from acne knows how the skin loses elasticity and has scars. After regularly drinking Nutribear, my skin has feels so much tighter, pimple marks from the occasional breakout also heal very fast. I couldn’t be more happier! My bones joints actually feel better consuming it. I have pain on my elbow, I take this like a supplement so far the sharp pain has decreased. I will get one bottle for my mum to try. I mix the collagen to my protein drink every morning. I have been drinking it consistently since nutribear is launched. It dissolves easily without giving any odd taste or smell. I can definitely see a difference in my skin. My skin used to be really dry and now it seems softer, plumper and more moisturised. The best part is my complexion is glowing! A highly recommended product! I suffered knee pain problem for several years cause I used to play badminton. My wife kind of nagged me to take this collagen and I am glad that she did. After taking for around 3 months the pain of my knee get lesser. I feel that it is very effective for my joints as it feels “looser”. It helps me improve my skin and not smelly. Will continue to purchase and consume. I have been taking this particular brand of collagen for a little more than 3 months now and unlike any other product that I have consumed before and for longer periods, already I have begun to notice marked changes in my skin complexion. My skin doesn’t anymore get flaky or dried up and is firmer and not so wrinkled. The collagen is pleasant to be consumed as it dissolves easily and does not have unpleasant smell or taste. I will surely continue to take this collagen product for good with high enthuasism and expectation to have more and sustained improvement in my skin, hair, and possibly other systems and general health. I’ve been looking into a good collagen supplement and thought I would give this a try since its more natural than other brands. This is definitely superior to other collagen powders I’ve tried, because it dissolves completely and has very little taste. I began taking this over 6 months ago to boost my protein intake, help with recovery workouts, and help control my appetite as I started eating healthier. Either way, if you’ve been on the fence about whether or not to try the product, I’d say, TRY IT! I am in love with this product. It made my skin less dry, after confinement my skin were very dry. Now its getting better. I don’t feel tired anymore. After work, i get home and still able to do house chores and play with my baby. It really boost up my energy. First time tried fish collagen powder. A bit worry on the smell at first but it’s actually almost non strong at all, dissolved easily and mixed well with others drinks. Almost tasteless if drink directly. So far so good. I do like it mix and drink everyday as my breakfast. Meanwhile packaging is awesome with spoon provided. Been consuming nutribear for 2 weeks. It improve my skin texture as my skin are more hydrate and pore are visibly shrink. Since my complexion are become more plumping and moisturised, it help me makeup stays long and go on smoother! Besides, I love the way of consuming it, as it can be added to any type of drink and soup, and doesn’t have strong taste or smell. I’ve tried so many brands of collagen and this is definitely one of the few that I would repurchase because it doesn’t have a strong fishy smell. I’ve seen improvement where my nails seems to be stronger than before. Worth a try. korang kena cuba nutribear sebab ianya membantu menambah kolagen dalam badan..bila collagen kurang,rambut mudah gugur,kulit kusam,kuku rapuh dan sebagainya..saya dah cuba..memang terbaik dan berkesan..
I’ve already consume this for almost a month. I am in love with this one. Since the secondary school, i’ve always got acne problem and sunburn. But now my skin is getting better and moist. Thanks for solving my problem. 5 stars!! Okay, I have to admit that I have doubts when I first opened up this bottle of collagen powder. I was expecting some fishy smell or unpleasant taste, but this is not the case. The collagen is really easy to use and all I do every day is just add it into my fruit juice. It doesn’t have immediate effect, but after about two weeks of usage, I can see noticeable difference in my body; I feel much more energetic, my nail does not break easily and my skin hair becomes much more soft and smooth to the touch. It’s really amazing, and will definitely continue to use this. I highly recommend this as a supplement for those who are not only wanting to look beautiful, but also healthy from the inside. Great for those who leads a busy life. Yeah dah cuba Nutri Bear ni.. Sangat sangat sangat bagus sebabnye produk ni dpt menambah kolagen dalam badan.. Rasanya pun best dan mudah disediakan.. I luv it!! Bila umur dah banyak ni macam-macam supplement kena consume. Salah satunya NutriBear ni. Mudah je nak bancuh. Tambah je 1 skop dalam air kegemaran korang. Siap. Macam-macam khasiat ada dalam ni. Kuatkan akar rambut, sihatkan folikel kuku dan macam-macam lagilah. Yang menariknya, sambil membeli sambil kita menyelamatkan beruang yang semakin pupus. 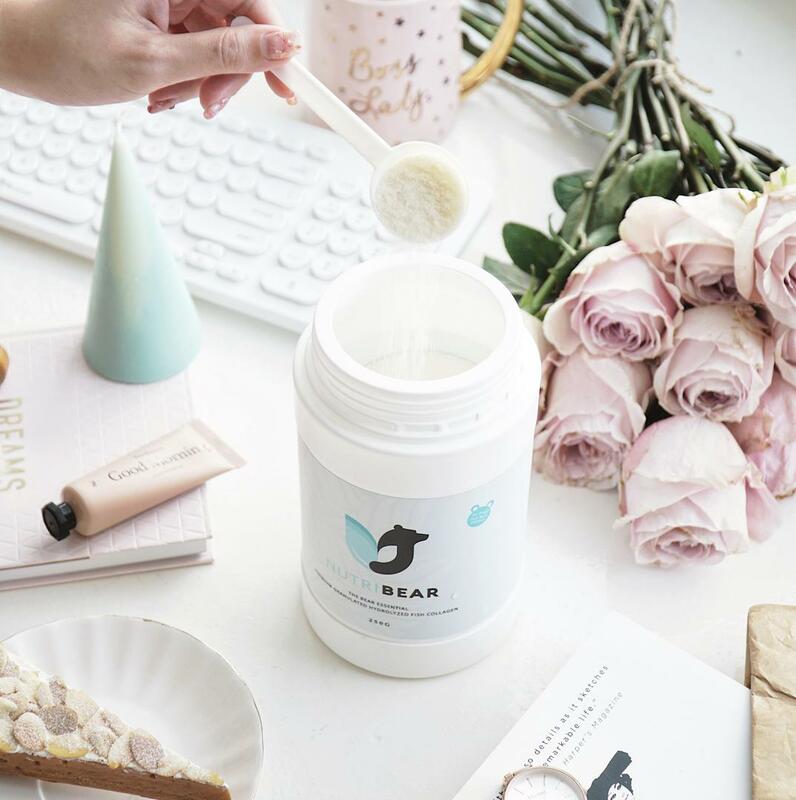 The taste of Nutribear Bear Essential Collagen are great! Guess what, it didnt taste and smells like fish collagen at all. How surprising! I took Nutribears Collagen when I was 39 weeks pregnant and I told my Dr regarding this collagen. My Dr approved it and yes I took it as my daily faveret drinks. So far I can see my skin looks more glowy and I feel energetic every morning when Im awake. Thanks Nutribear! I did not believe that the Nutri Bear supplement is really amazing for my skin. During this time my skin a lot of small seeds now began to shrink and slippery. Likewise with the pores on my face disappeared. I was very excited when my friend told me that my skin was shining and glowing. I’m so love it NutriBear… I strongly recommend NutriBEAR for you all. Been taking it for 2 months and so and i felt my skin’s turgor improving and has become more fine. Also felt more refresh each day i woke up. Easy to consume also with just a spoonful each day. Does not smell and does not stick to your mouth when consume directly. I really like this Nutribear because it is very easy to consume and adds more collagen to my body. My skin looks glowing now. All I have to do is just mix it any of my drink and consume it. Love the collagen so much, not only me also my husband who without fail will add a spoon to his daily drink. why we both loved nutribear essential? coz I can see the result, my skill glowing and healthier also I seems like no more ache on my muscles too. I am on this collagen for almost 3 years, and I never thought of stop taking it ever since. Not just the improvement of complexion, I no longer feel the pain in my knees after long sitting down that I used to have. I believe in the product, but the commitment and persistence count too. More than happy when my mom has been sticking to taking collagen as long as me! At first, I was skeptical whether it would work. After having it for a few days I realized my skin never felt better. It’s one of those superfood that you could be versatile with. For example l, when life is boring try adding it onto you daily meals. I’ve tried shakes, curries and even soups! By itself was a little plain but it is not a bad product at all! 5 stars! I mix this collagen to my Vitamin C drink together. My back acne reduced since I’m consuming the collagen. My face complexion also improve. Thanks Nutribear. Last time, I have serious sunburn and scars problem. 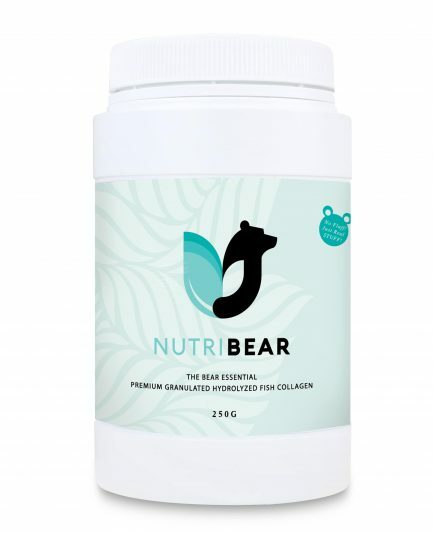 I have tried other types of collagen before but nutribear suits me well! My skin getting softer and more moisture! This is my first time consuming fish collagen and I thought it will be smelly but my thought is wrong, it is not smelly. I mix it with fruit juices and drink everyday before I go to sleep. Been consuming nutribear for 3 weeks, and I just fall in love with this. 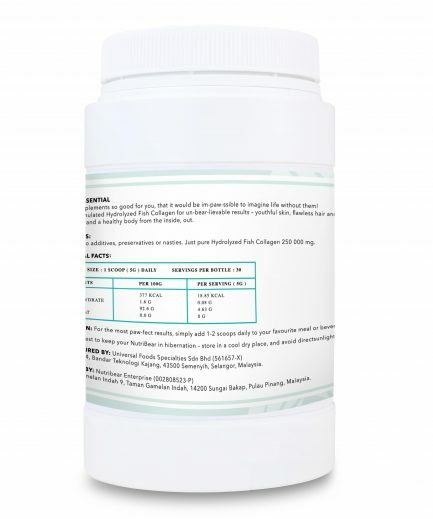 5 Stars for this amazing collagen!